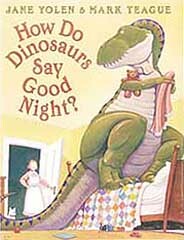 How Do Dinosaurs Say Good Night? 14" Doll is a soft and substantial plush playmate who carries along a toy and blanket for extra fun. 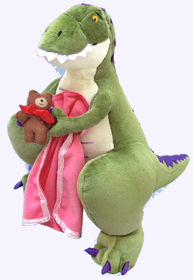 Big and huggable, this sleepy dinosaur is the perfect companion for little ones getting ready to say good night. Ages 0+. 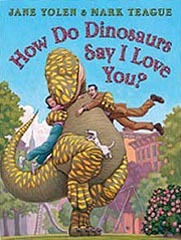 Brimming with humor and familiar good-night antics, here is a playful peek into the homes of dinosaur children and their parents at bed time. Perfect for sharing and reading aloud, this is one nighttime book your own little dinosaur will want to read again and again. Hardcover. Ages 3 - 5. 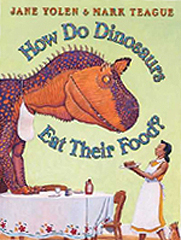 How does a dinosaur eat all his food? Is he noisy and jumpy and spilling and rude? Does he toss milk and peas? Does he ever say, "Please?" 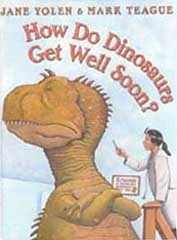 What does a dinosaur do? Hardcover Ages 3 - 5. 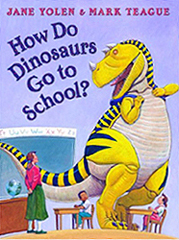 What would you do if a very large ceratosaurus stomped into your classroom? And what if a gigantic silvisaurus decided to jump on top of his desk? Come along where dinosaur show-and-tell, story time, and recess antics will make even the best-behaved young dinosaurs laugh aloud. Hardcover. Ages 3 - 5. 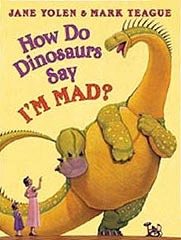 When little dinosaurs get angry, they sometimes misbehave. 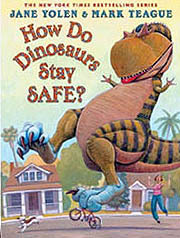 When it's time to slow down the wailing and stomping, what do dinosaurs do? Hardcover. Ages 3 - 5. Do siblings ever fight over a toy? Do good friends at school ever push or call names? And do buddies also know to share, give cookies, and aplolgize? 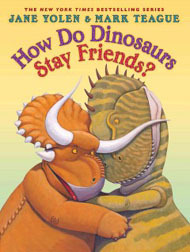 Come along and laugh as little ones make friends and stay friends...the dinosaur way! Hardcover. Should a dinosaur balance on top of a chair? Ride a bike with no hands? Or run out of sight? NO! Even a gigantic majungasaurus who fills the whole pool knows to stay where Papa can see him. We all do lots of things to stay safe at home, in the neighborhood, and at school. What do you do? Hardcover. Ages 3 - 5. Little dinosaurs sometimes misbehave or make a mess, but no matter what they do, their mamas and papas always love them. Come along and join the fun as some very unruly children test the patience of their grown-ups...but also sho how much they love their parents, too! Hardcover. Can you imagine dragging a very stubborn styracosaurus into the doctor's office? Or saying "Open wide" to a very sharp-toothed carnotaurus? From enormous sneezes to gigantic wails, the outrageous antics of the mischievous young dinosaurs are sure to bring laughter to any one who has ever said ATCHOO! Hardcover. Ages 3 - 5. 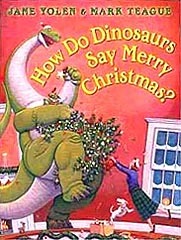 Even during the holidays, little dinosaurs sometimes misbehave. But when Mama comes in with the holiday lights, it's time to share a special tradition. 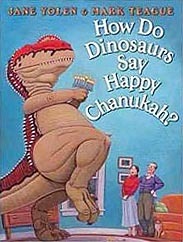 How do dinosaurs celebrate Chanukah? With an abundance of love, joy, memory, and gratitude! Hardcover. Ho Ho Ho! Christmas is coming, and the little dinosaurs can't help a little mischief while they're decorating trees, hanging stockings, and itching to peek at brightly wrapped presents. But Santa is on his way, so children everywhere are trying to behave!